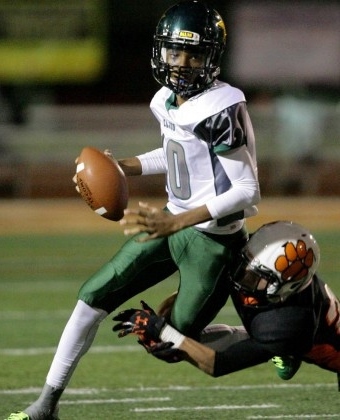 San Bernardino Cajon QB Jayden Daniels will be looking to avoid a sophomore slump. It’s Redlands East Valley, San Bernardino Cajon and a battle for playoff positioning after that. No one goes undefeated in CBL this season. The REV-at-Cajon contest on Oct. 28 should present a No. 1 seed, but with REV going for an amazing 10th straight CBL title the Wildcats have to be favored for at least a co-title. Redlands and Yucaipa could also state their case for that second spot. Carter should play everyone close. Miller is two players away from a slot in the league’s upper tier, just a couple players ahead of Citrus Valley and Eisenhower. REDLANDS EAST VALLEY (9-3, 6-1) Pre-season CIF-SS rank #38. Senior Armando Herrera has already accomplished enough to be considered one of the top throwing QBs in San Bernardino County history. Junior all-purpose back Gabriel Clark should be a factor. Senior RB Vincent Bilderrain has shown promise. Linebacker’s Jaelan Phillips and Voi Fata are a frightful presence. SAN BERNARDINO CAJON (11-2, 6-1 CBL) Pre-season CIF-SS rank #53. The Cowboys can be summed up in two words: Jayden Daniels. As a freshman led Cajon to a 37-17 win at REV, a totaled 2,694 yards and 38 TDs on the year. Zero of his top three receivers return, but he and senior RB Aaron Ortega have a massive offensive line to run behind. LB Nicolas Wilson leads the defense. RIALTO CARTER (7-3, 4-3) Pre-season CIF-SS rank #142. Long known for a stingy defense. Shouldn’t be any different this season. QB Sonny Robinson should put up numbers, but graduation of RB Spencer Coleman leaves a big hole. Ethan Howe made big plays on defense last year and should do the same. The Lions will upset someone. YUCAIPA (8-4, 4-3) Pre-season CIF-SS rank #59. Perhaps best offensive line in CBL but who will run behind it. Three-year starting QB Nathan Martinez is always a threat. Gavin Norris looks like a good target. DBs Josh Torrance and Asani Hampton are two of the best. TE Blake Barbour could be a sleeper. REDLANDS (8-4, 5-2) Preseason CIF-SS rank #38. Nearly all starters graduated including entire backfield. New quarterback Steven Garcia has thrown only ten varsity passes but directed Redlands to titles at JV and frosh level. All-purpose Doug Haugh should get plenty of touches. FONTANA MILLER (2-8, 1-6) Pre-season CIF-SS rank: #245. First-year coach Shawn Moore faces a challenge. Has skeleton crew of exceptional players led by QB Malik Flowers and Joseph Radgowski who could lead the Rebels to one CBL upset. REDLANDS CITRUS VALLEY (4-6, 2-5) Pre-season CIF-SS rank #169. Could be a long season. RB Lawrence Lopez likely to carry the load. Isaac Isaiah and Kellen Pachot are able offensive threats, with Tristen Nichols anchoring the defense. RIALTO EISENHOWER (1-9, 0-7) Pre-season CIF-SS rank #264. First year coach Al Brown gets to rally his team in Ron Lott Stadium. There’s a full roster here with school spirit galore, so anything can happen. Ike will build around sophomore DT/OT Sataoa Laumea. Aug. 26 — Palm Springs at Redlands, 7 p.m.
Sept. 9 — REV at Upland, 7 p.m.
Sept. 9 — Cajon at Fontana Kaiser, 7 p.m.
Sept. 16 — REV at Menifee Heritage, 7 p.m.
Sept. 30 — Redlands at Yucaipa, 7 p.m.
Oct. 7 — Redlands at REV, 7 p.m.
Oct. 7 — Carter at Yucaipa, 7 p.m.
Oct. 14 — Yucaipa at Cajon, 7 p.m.
Oct. 28 — REV at Cajon, 7 p.m.